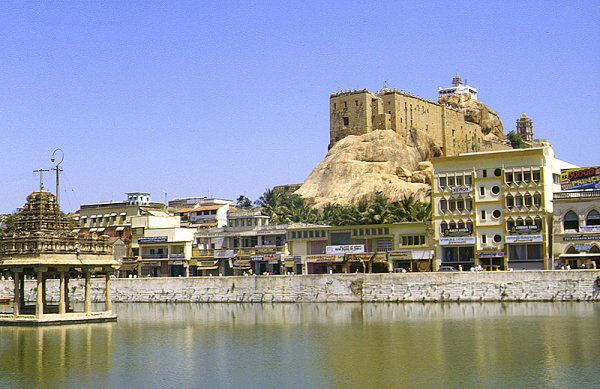 Tiruchirappalli is the fourth most populous city of Tamil Nadu. It is situated in the centre of the state, on the banks of the Cauvery River. The city is a City corporation, the administrative headquarters of Tiruchirapalli District. Tiruchirappalli encompasses Srirangam , the foremost Vaishnavite temple and the biggest functioning Hindu temple in the world. Tiruchirappalli also emcompasses "ThiruAnaikka" (ThiruvAnaikkaval), one of the five main abodes ("Panchaboodha Sthalam") of Lord Shiva. ThiruvAnaikkaval is the House of Water. The name of the town, "Tiruchirapalli", originated as a tribute (thiru in Tamil means respected) to a Jain monk called "Chira". There is also a belief that Tiruchirapalli was named after a three headed demon "Trishira" (the son of Ravana) who performed penance at the Siva temple here and obtained boons here. There is yet another belief about the origins of the name Tiruchirappalli. Apparently the name started out as Thiru Javvandhipuram (Place of Marigold flowers; javvandhi, the Tamil name for the flower Marigold which grew (and still does) in abundance in and around this region and the word puram refers to a place of dwelling) which over time becameTiruchirappalli.